Seoul, South Korea and Los Angeles, California (April 23, 2018) – CJ 4DPLEX, the world’s leading 4D cinema company, and Cineworld Group plc have expanded their partnership to bring the immersive 4DX technology to theatres across the U.S. and EMEA regions. As a result of this agreement, there will be 145 total 4DX auditoriums across Cineworld Group’s worldwide footprint, adding 79 Regal Entertainment locations in the U.S and 20 Cineworld Cinemas and Cinema City theatres across Europe and the Middle East. This marks a major expansion of 4DX – the fastest-growing premium cinema format, featuring motion seats and environmental effects that add to the moviegoing experience. It also significantly builds on the relationship between its creator, CJ 4DPLEX, and Cineworld, which combined with Cinema City International in 2014, and completed its acquisition of Regal Entertainment earlier this year. Cinema City was the start of the relationship between the two companies when, in 2012, the exhibitor opened the group’s first 4DX in Israel and has constantly developed since. There are currently six Regal 4DX locations in the U.S. Today’s news expands the rollout plan from 15 to 79 additional Regal theatres across the country. Already confirmed markets in the partnership include Atlanta, Chicago, Jacksonville, Honolulu, Philadelphia, Houston, Irvine, Nashville, Miami and San Diego. The new deal will brings the total of 4DX locations set to be opened in the coming years to 85. Across Cineworld Cinemas and Cinema City-branded theatres, there are currently 40 4DX locations: 16 in the UK, six in Poland, five in Romania, four in Israel, three each in Hungary and the Czech Republic, two in Bulgaria and one in Slovakia. In addition to this, 20 more 4DX sites will be expanded across the EMEA regions to complete 60 remarkable 4DX locations. “The success we have seen so far in this with this partnership has been outstanding and we expect our moviegoers will continue to seek out the newest titles in 4DX. Being at the edge of cinema exhibition is always a goal and working with CJ 4DPLEX is one of the ways we can deliver future-thinking cinema experiences to our audience members.” said Mooky Greidinger, CEO of the Cineworld Group. 4DX – which incorporates features effects such as motion, vibration, rain, wind, bubbles, lightning, scent and more into popular movies to bring fans into the action – recently became the fastest premium cinema format to hit the 500 location milestone (link to release). Since debuting in 2009, more than 480 Hollywood titles have been screened utilizing the popular, immersive technology. 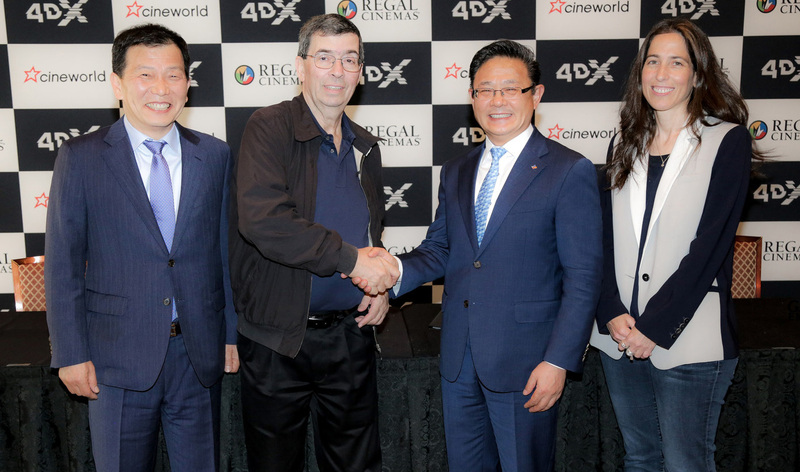 “Cineworld continues to be an excellent partner and by further adopting 4DX at even more locations in the US, it shows that the company has a commitment to bringing its patrons the most advance cinema experience possible,” said Byung Hwan Choi, CEO of CJ 4DPLEX. Cineworld Group was founded in 1995 with its roots going back to 1930 through the combination with Cinema City in 2014. In December 2017, Cineworld acquired US cinema chain Regal Entertainment Group. Following completion of the deal in February 2018, the enlarged Group became the second largest cinema chain in the world, with 9,538 screens across the US and Europe. Cineworld is operating cinemas today in ten countries: the US, the UK, Ireland, Poland, Romania, Israel, Hungary, Czech, Bulgaria and Slovakia, covering a market of approximately 500 million people. The acquisition of Regal provides Cineworld with a major presence in the US cinema market, the largest box office market in the world. Cineworld’s primary brands are Regal (in the US), Cineworld and Picturehouse (in the UK & Ireland), Cinema City (throughout Europe) and Yes Planet (throughout Israel).